RACE DAY BIB PICK-UP: Available from 7:30am-8:30am at Race Day HQ located at the Veterans Park in Manchester, NH. APPAREL: The first 2,000 registrants in the Manchester City Marathon, Half, Relay & 5k will receive a long sleeve event shirt. 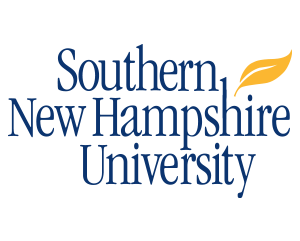 Additional Event merchandise, RunNH merchandise, nutrition, and gear can be purchased at the Expo. PARKING: There is ample city parking in downtown Manchester. City meters are free on Sundays. GEAR CHECK: Gear check will be available for all participants in the Race Day HQ area. Simply check your bag in the Pelmac Industries Secure Gear Check tent inside Race Day HQ and pick it up after you finish. Join us at the warming tent near the finish line on Elm St provided by our friends at Eastern Propane & Oil! POST RACE REFRESHMENTS: Dasani water and Powerade are provided by Coca Cola Northern New England, pizza provided by American Flatbread Company, and Yogurt provided by Stonyfield Organic in the area of Race Day HQ. All results will be displayed live at the Millennium Running timing trailer adjacent to the finish line. Live online results will be published exclusively on MillenniumRunning.com. Results will be emailed to those that register online. 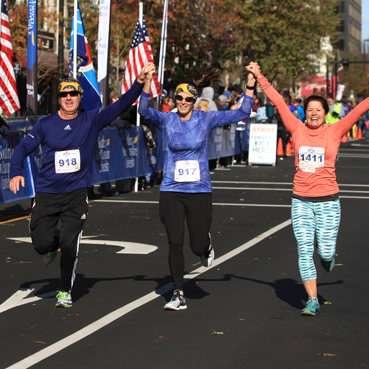 RACE PHOTOS: Millennium Running is happy to provide FREE digital race photos from this event. Photos will be posted online 2-3 business days following the event. FINISHER MEDALS: Medals will be distributed at the finish line to all Marathoners, Half Marathoners, and Relay Teams. AGE-GROUP AWARDS: Cash Awards are given to the top 3 men and women in the marathon. Awards will be given to the top 3 male and female in each 5-yr age group. (19 and under, 20-24, 25-29, 30-34 … 70+). Stop by the Awards Tent following the race to claim your award. Only cash awards will be mailed after the event. RELAY TEAM AWARDS: Awards will be given out to each winning relay team in the male, female and co-ed divisions in the Marathon Relay and Half Marathon Relay. POST RACE SHOWERS: After the race head down to the YMCA at 30 Mechanic Street (1/2 block off of Elm St.) for post-race showers. Let the staff know you participated in the race to gain access to the locker rooms. 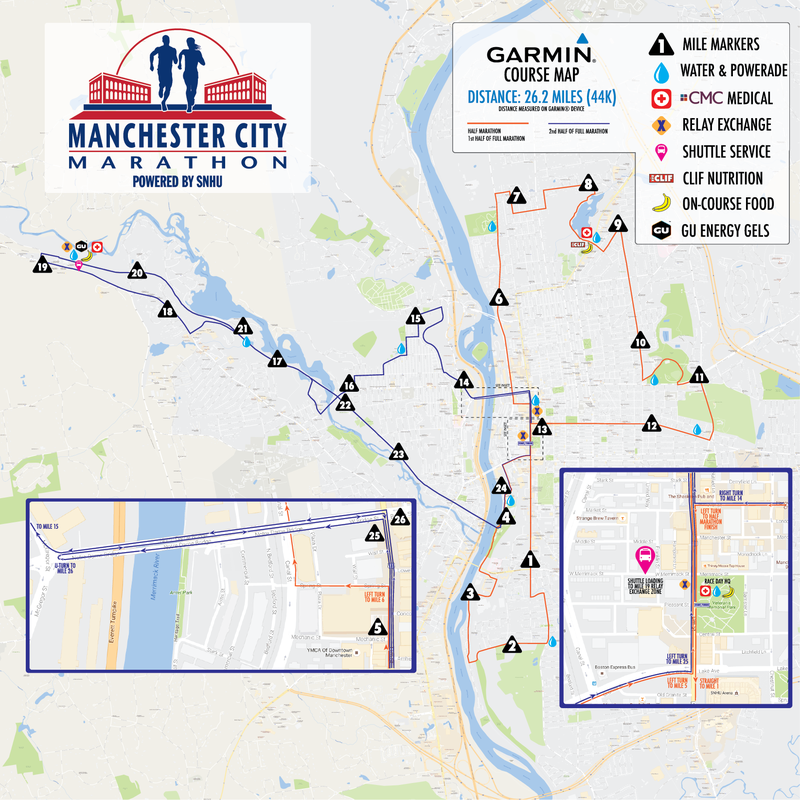 Doing a Relay with friends and/or family is perhaps the most fun way to participate in the Manchester City Marathon or Half Marathon! 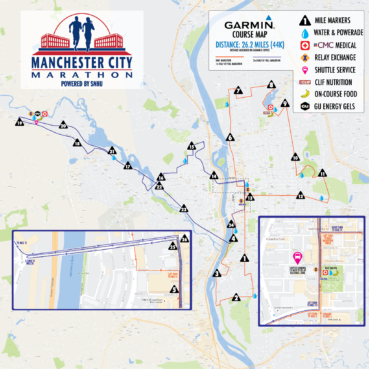 You can participate as a 2-person Half Marathon Relay or a 4-person Marathon Relay which runs concurrently with the Manchester City Marathon and Half Marathon. Below you will find all the finer details on how to participate as a relay team. For more general event information for the Half Marathon or Marathon, please refer to the respective event details pages. 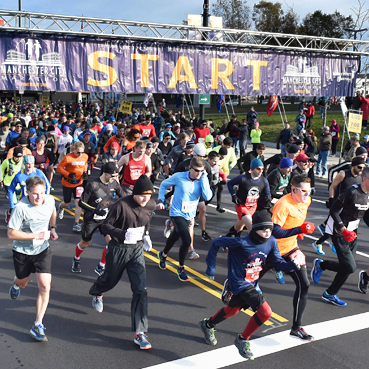 RELAY DISTANCES: Relay splits are as follows: Leg 1 – 4.6 Miles (Half & Full), Leg 2 – 8.5 Miles (Half & Full), Leg 3 – 5.7 Miles (Full), Leg 4 – 7.4 Miles (Full). TEAM REGISTRATION: The Team Captain will be in charge of registering the entire team online and picking up race packets for their relay teams. TEAM CAP: The relay is limited to the first 125 registered teams. 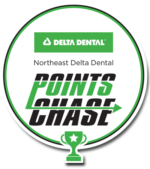 Registration will close once the 125-team limit is reached, this number is a cumulative number of teams in both the full and half-marathon distances. RELAY FINISHER MEDALS: All medals will be distributed in the finish line area to the finishing member of your relay team. We encourage all relay team members to finish together with your final team member! APPAREL: The first 2,000 registrants in the Manchester City Marathon, Half, Relay will receive a long sleeve event shirt. Additional Event merchandise, RunNH merchandise, nutrition, and gear can be purchased at the Expo. RELAY TIMING INFORMATION: Relay teams must exchange the velcro timing chip with the next runner in their transition area. All relay runners must wear the timing chip on their ankle as well as their bib on the front of their body. Relay team results will be broken down by each relay leg and published accordingly. RELAY EXCHANGE ZONES: Relay exchange zone 1 will be across from the start/finish line on Elm Street – Relay exchange zone 2 will be at the intersection of Lowell and Elm Street on Elm St – Relay exchange zone 3 will be at the UNH Co-operative parking lot between the Goffstown Rail Trail and Mast Rd (shuttle provided). RELAY TRANSPORTATION: Relax exchange zones 1 and 2 are within walking distance of the Start/Finish area. Relay exchange zone 3 will have a shuttle running from the intersection of Franklin St and W. Merrimack St. (behind Portland Pie) to the exchange zone and back ONLY for relay runners. RELAY TEAM AWARDS: Awards will be given to the top three in the half and full relays; in the male, female and co-ed divisions. GEAR CHECK: Simply check your bag in the Pelmac Industries Secure Gear Check tent inside Veteran’s Park and pick it up at the gear pick-up tent after you finish. There is no gear check at any of the relay exchange zones. 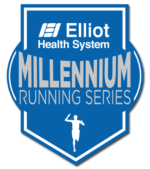 ELLIOT MILLENNIUM SERIES: The Relay events will count as 6.55 miles and 1 race for each relay team member towards completion of the Elliot Millennium Series. Registrants are encouraged to pick up their race packets, shop for Event Merchandise and all your running needs, and visit our vendors at the Expo. 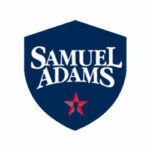 This Boston Qualifier will give you a tour of NH’s largest city, just 45 minutes north of Boston. Starting in downtown Manchester the course runs through the historic Millyard, the North End, and crosses over the Merrimack River to the Goffstown Rail Trail before returning downtown to finish. The full marathon follows the same course as the Half Marathon for the first 13 miles. Just after the 13 mile mark, the course takes a RIGHT on Elm Street just before the the location of the second transition. The course then crosses the Merrimack River on the Bridge Street Bridge, and sweeps through the Rimmon Heights section of the city. At mile 16 the run will cross the Piscataquog River on the Kelly Street Bridge, and then turns right before entering the Piscataquog Trail. From this point on, right through to the finish, the course is very flat. Runners will stay on the rail trail until the UNH Co-op parking lot before a quick run onto Route 114 until the 19-mile mark where they will find the third, and final, relay transition point. The course turns right on Henry Bridge Road then right again on the Goffstown Rail Trail. This is a very scenic portion of the route as it follows the Piscataquog back to Manchester. 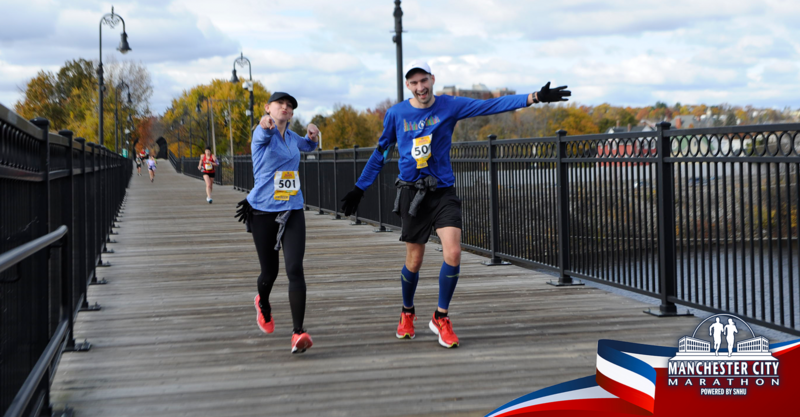 At mile 22 the run crosses the new “Trestle” bridge and continues back to the city, crossing the footbridge over the Merrimack River and running the final miles in downtown Manchester with a final trip across the Notre Dame Bridge and back to Elm Street where the race began. This section of the course consists of rolling hills leading up to the intersection of North River Road and Bennington Street where the run turns right. Just after the 7.5 mile mark the course turns right on Campbell Road and heads downhill to Juniper Street and enters the Dorrs Pond trail. From here the route crosses the Daniel Webster Highway and turns left then right before entering Belmont Street and heading south. At approximately 10.5 miles the run turns left on Circular Drive and sweeps around the perimeter of Derryfield Park. It exits the park on Bridge St and turns right on to Mammoth Road past the Derryfield Country Club. The course joins Hanover Street for a one-mile cruise back to downtown Manchester. At the intersection of Hanover and Elm Street, the half Marathon turns left and heads to the finish line. 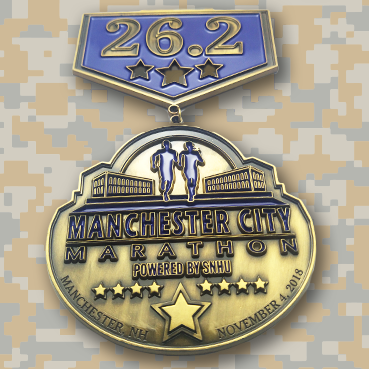 Millennium Running is proud to have Veterans Count as the official charity of the Manchester City Marathon, powered by SNHU. Each registrants has an opportunity to support our Veterans by participating in the optional fundraising platform that is auto-created when you register online. In 2017, over 30,000 was raised for Veterans Count and we hope you can help us make a difference. Veterans Count has the mission to provide critical and timely financial assistance and services when no other resource is available to veterans, service members, and their families, to ensure their dignity, health and overall well-being. Our goal is that 90% of every net dollar raised for Veterans Count is spent to provide services and grow resources for NH veterans, service members, and their families. In 2006, Veterans Count was developed in partnership with ESNH, the NH National Guard, and the NH Dept. of Health and Human Services. The program provides critical resources to veterans of all eras and their families. Care Coordinators work with individuals and families to create a care plan toward self-sufficiency. Since ESNH launched the program, over 9,300 individuals have been served. Philanthropic dollars, totaling more than $2.6 million, have been distributed to provide financial support that may include food, home maintenance, housing, rent, fuel assistance, utilities, vehicle repair, gasoline, medical bills, and child care. New Horizons for New Hampshire, first organized in 1973, operates an emergency homeless shelter, soup kitchen, food pantry and Angie’s Shelter for Women. The shelters house an average of 80 people each night, the soup kitchen serves over 250 meals daily and the food pantry provides food to over 900 families each month. New Horizons is a non-prot 501c3 organization. Being a non-profit, the Manchester City Marathon knows the value of community support. We recently had the honor of presenting New Horizons for New Hampshire with a $1,500 donation. Together we can make a difference in our community! The Mental Health Center of Greater Manchester is a private non-profit community mental health center that has provided mental health services to children, teenagers, adults and seniors for 50 years. We offer a broad range of services including: therapy; medication; home and community based care; case management; and vocational services to people who are challenged with mental illness. We also provide 24/7 crisis response as well as traditional counseling to meet the needs of the community. All donations to MHCGM help to ensure that children and families, who have the greatest need for behavioral health care, will receive professional services. All funds raised will help to provide treatment to the uninsured and under-insured that are affected by mental illness. Your support gives those folks a running start in life on a road to recovery. The Mental Health Center of Greater Manchester is the largest outpatient mental health care provider in the State of New Hampshire, treating over 10,000 individuals a year. Our services allow others the opportunity to enjoy quality of life with the hope of recovery. The PMC Kids Rides features; tykes on tricycles play on short obstacle courses, intrepid teens take on treks of 5, 10, or even 26 miles. PMC Kids Rides offer various courses, mileage, and features including music, games, silent auctions, face painting, and food. And every PMC Kids Ride provides kids a good time and an opportunity to do good work all while raising money for Dana-Farber Cancer Institute. By being apart of the PMC Kids Rides program you are part of the Pan-Mass Challenge’s $48 million goal. The Friends of The Goffstown Rail Trail is an organization of energetic, dedicated citizens volunteering to participate in the promotion, design, development, and maintenance of this resource. Everyone is welcome to contribute to this project.